Now that we've dealt with panning in our rough mix, it's time to address the levels. The goal is simply to find a basic balance that allows you to hear each element as clearly as possible, in accordance with your vision of the sonic puzzle. Imagine the scene: You are in the process of setting the levels of your tracks, the mix sounds fine, but the guitar seems to lacks something, so you decide to pull the fader a bit up. Suddenly, everything seems to fall into place for the guitar, which has come forth thanks to that couple of extra dBs. The problem is, now it's the vocals that seem to be fainter. No big deal, a couple of dBs more and they will come back to the front! But where did the snare go? A slight boost won't do any harm. But if you increase the level of the snare, you might as well do the same for the kick. But now the bass seems lost, so you'll have to boost it too. So now it's once again the guitar that lacks something...And that goes on and on until you simply can't increase the volume of any track any further. Sounds familiar? Don't worry, it's quite normal. We've all gone through that! Yet, it is very easy to avoid this situation by taking a somewhat stricter approach, as we are about to see. Right now it's best to set the volume of all other tracks relative to your featured instrument. Start raising the faders gradually one by one, from most important to less important, according to their role in your vision of the sonic puzzle. The idea is to raise the volume of the track until it starts to step on the toes of the instruments that you've already set, and then pull it back a little. You want it to be audible without interfering with the other tracks. To put it into more practical terms, imagine that the order of importance of your puzzle is as follows: Vocals, drums, guitar, bass, backing vocals. 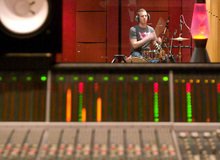 First, set the vocals to -3 dB, then raise the drums until they start to outweigh the vocals. Right at that moment, you should decrease the drums so that they can still be heard but without clashing with the vocals. Now move on to the guitar and bring up the volume until it's above the drums and reduce it a bit. Do the same with the bass, etc. If, for some reason, you think a track isn't loud enough, following the same logic, you should reduce the less important instruments compared to this track, but be careful not to touch the fader of the instrument the seems too soft! The way you should think about it is "the other tracks sound too loud" not "this track sounds too soft." This all seems very nice and easy, but this method of doing things neglects an obvious characteristic of music, namely, it's "living" aspect, which results in the instruments being louder or softer depending on the different song parts. For example, it might be that the level of the guitar is perfect during the verse, but it goes up quite a bit during the chorus and simply overshadows everything else… Well, in such cases, you should set the fader of the track in question in a way that it sounds right when it's at its loudest. It follows that this instrument will sound too weak in other parts, but that's something we will take care of with some EQ or compression later on. The advantages of doing it this way are many. First of all, it avoids you the vicious circle I referred to above. On the other hand, you will preserve the headroom you patiently worked for during the "Gain Staging" phase and, even better, it will emphasize this "virtual headroom." Finally, this method won't take you more than 10 minutes once you're used to it. What else could you ask for? One last remark before we finish. This way of doing things might seem too scientific, cold, analytical, etc. In short, it doesn't sound too appealing and is far from the "romantic" idea you probably have about mixing where only music matters. And you are totally right! All jokes aside, the main goal of this method is to make you change your perspective so you don't approach a mix thinking "it lacks this and that," but rather "there's too much of this and too much of that," which is preferable. Once you've gotten used to it, it will become natural, and the scientific side of it will give way to your instincts. And trust me, music will be the big winner in all this. Once you are done with the rough mix, switch to stereo again and give it all a listen. It will obviously not be perfect, but you will surely notice that the whole starts to take shape and better resembles your vision of the song, especially if you compare it to the bounce you made at the end of the "Gain Staging" phase. To wrap up the rough mix stage, I recommend you to do a new bounce of the song at this point so that you can always come back to it, if necessary. In the next chapter we'll talk about equalization, a pretty vast topic indeed!